Shinsui, Ito (1898-1972) "No. 13- Summer Fan" - Machine Printing - Chinese and Japanese woodblock prints for sale, silkscreen, scrolls, watercolor, lithographs. Artwork Details for Shinsui, Ito (1898-1972) "No. 13- Summer Fan"
Condition: Near fine. Has the usual paper anomalies common to all examples of this scene (chunky paper fibres, etc.). 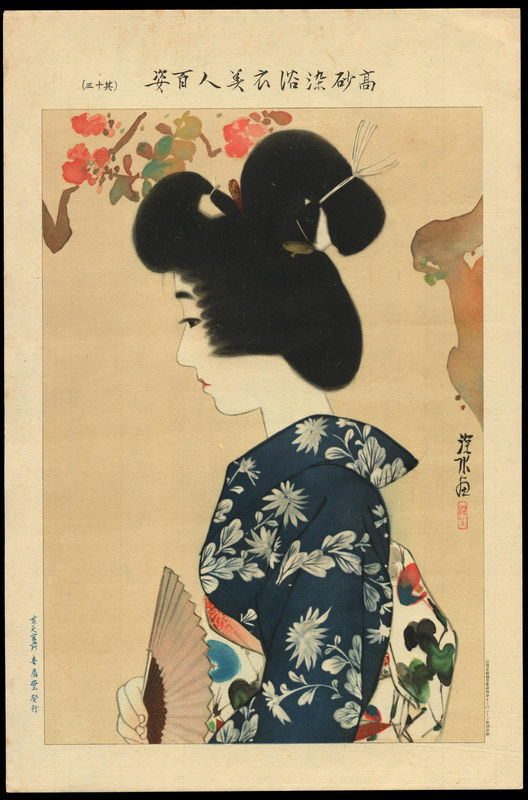 Notes: Rare pre-war machine printing (possibly a lithograph) of a gorgeous 'bijin' (beauty) wearing a Takasago-dyed kimono, by Ito Shinsui. Takasago dyeing is a special fabric dyeing process developed in Japan that dates to the 1600s. Rarely seen in the market. Artist signature and seal within the image area. Prints from this series are machine printed or possibly lithographic items, and they are the finest examples of pre-war machine printing I've seen. According to a seal in the lower margin of each print they were printed using a patented "KI Banton" platemaking process, so probably an advanced technique for that era. Each scene is printed on washi paper (contains the usual chain lines) and without close inspection it is difficult to determine that these are not woodblock prints. Interestingly, it would appear that none of these scenes are directly copied from Shinsui's other works (woodblocks or paintings), so I assume that Shinsui composed these especially for this series. 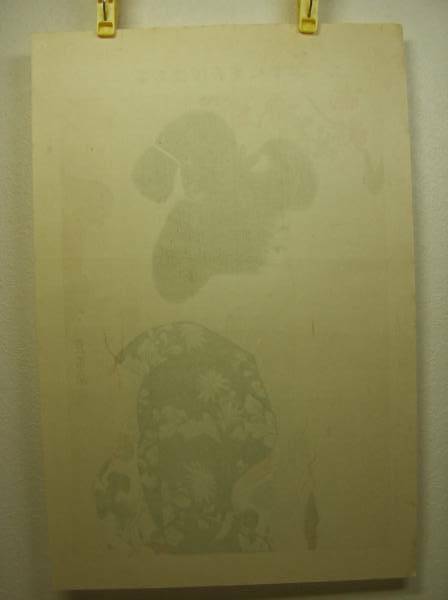 Each print is untitled, so where possible I've taken titles from similar woodblock print examples of Shinsui works.